Marine reserves at the Channel Islands are producing more and bigger fish, according to a scientific study reported at a special session of the Channel Islands Symposium. The study used about 1700 fish counts from REEF.org volunteer divers. So far the results are for relatively rapidly-reproducing fish. Over the next few years, longer-lived, slower-reproducing fish like rockfish should show some beneficial results as well. It'll be interesting! 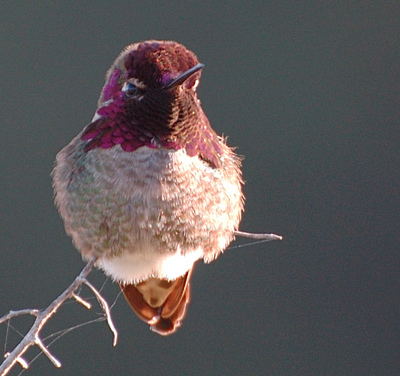 This small hummingbird sat on a branch near the Goleta Slough and did not mind when I approached for a few photos. From his lack of fear, his fluffy feathers and his small size I suspect he was a youngster. I think he is an Anna's Hummingbird, and a male. 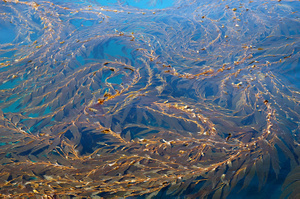 Krill float above this path in the sand near San Miguel Island. 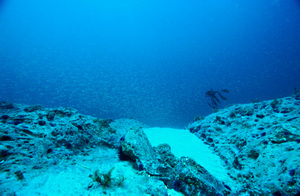 This scene was at a depth of about 60 feet, at Oil Spring, a reef just north of San Miguel. The photo was made in March. In mid- or late winter, if it's possible to reach San Miguel, then the diving can be good! Oil is the reason for the wars we wage. But, the oil found under the Santa Barbara Channel is heavy and rich in sulfur: it isn't profitable to turn it into gasoline or other light hydrocarbons. That may be part of the reason some propose to turn Platform Grace, sister platform to Gina and not far away, into a receiving port for natural gas from Australia. The gas would then be piped to the mainland, far from the risks of environmental catastrophes including disastrous explosion. It's a long haul from Australia. 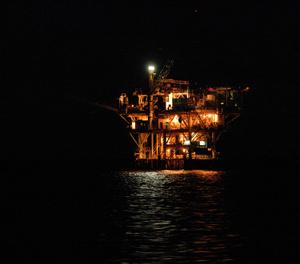 Meanwhile the platforms generate electricity from the gas they do prouce: and light themselves up at night. There's money to be made.